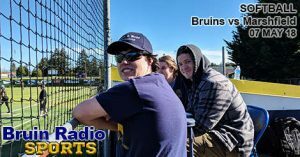 This is Bruin Radio Sports, featuring a play-by-play show hosted by students and staff of the Brookings-Harbor High School! The Bruins Softball team plays against the Marshfield Pirates on this beautiful 7th of May in their final home game of the Bruins girls season. Our table is competently staffed with local adult Softball League player Rob Olmos, high school Senior Jedidiah Doan, Bruins Softball veteran and alumnus Jessica Yock, and Dane Tippman.